Unionist Voice explores the continuing links between Sinn Fein and the still active IRA. Sinn Fein this week held a meeting with the PSNI Chief Constable, in which they claimed to have raised the issue of the activities of loyalist organisations. Many Unionist’s will view this as the height of hypocrisy given Sinn Fein’s inextricable links to the still active IRA Army Council. Unionist Voice has carried out an investigation into the continuing links between the IRA and Sinn Fein. In 2015 a Government report into the status of illegal organisations stated that MI5 and Police intelligence believe that the IRA Army Council “oversees both PIRA and Sinn Fein with an overarching strategy“. This report makes abundantly clear that Sinn Fein continues to be controlled by the IRA Army Council, which the independent report revealed still had access to illegal weapons. The report flowed from the IRA murder of their former hitman Kevin McGuigan. He was gunned down in the Short Strand area of Belfast in retaliation for the murder of IRA Belfast Brigade Commander Gerard “Jock” Davidson. 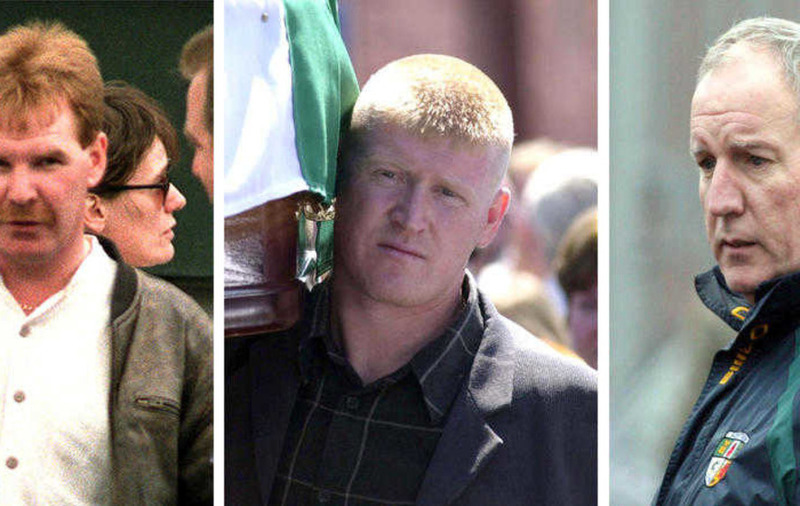 The murder was authorised by senior IRA Army Council ‘hawk’ Brian Gillen with the knowledge of former Sinn Fein Northern Ireland Chairperson Bobby Storey and Ardoyne republican Eddie Copeland. Jock Davidson had been stood down from the IRA for a period of time as part of Sinn Fein’s cover-up in relation to the 2005 murder of family man Robert McCartney in Belfast. 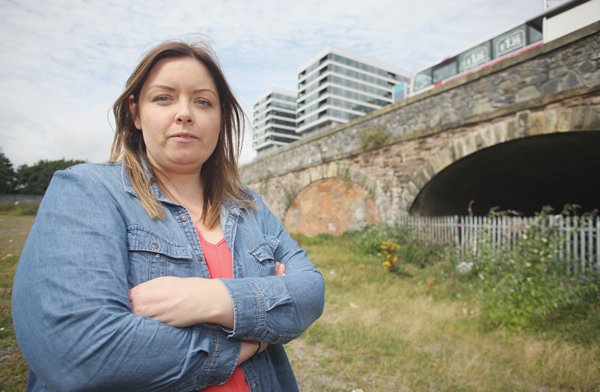 Sinn Fein members, including current Belfast City Councillor Deirdre Hargey, were present in the bar on the evening of the gruesome attack on Mr McCartney. Councillor Hargey has never provided a statement to the PSNI in relation to the events of 31 January 2005. It is understood Sinn Fein did not raise the issue of many of their prominent members withholding information in relation to the murder of Mr McCartney during this week’s meeting with the PSNI. The current IRA Chief of Staff is Martin “Duckser” Lynch. 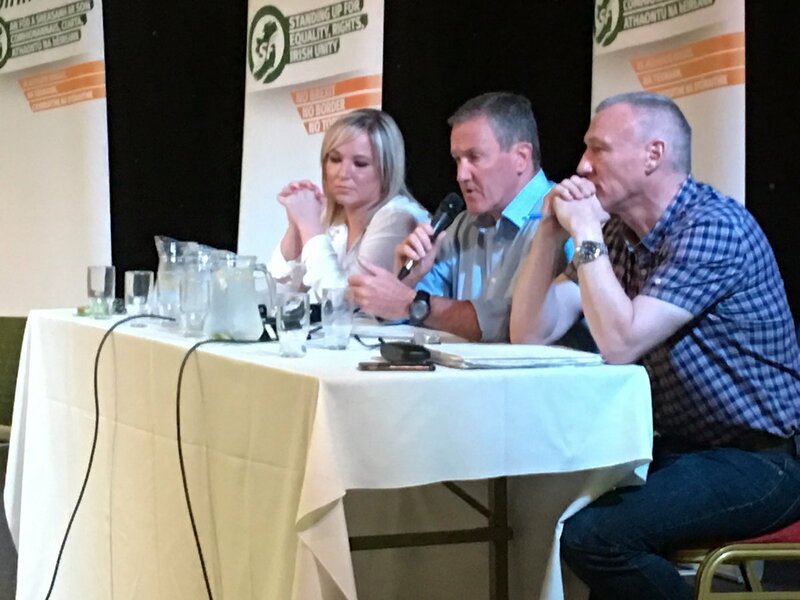 He is pictured here alongside Sinn Fein leader Michelle O’Neill only last month. Lynch and O’Neill were chairing a public meeting of Sinn Fein alongside convicted South Armagh IRA terrorist, Conor Murphy. Sean ‘Spike’ Murray, who in recent years has been under PSNI investigation for IRA gunrunning during the ‘peace process’, remains a senior member of the IRA Army Council and acts as a link man between the Army Council and Sinn Fein. He is assisted in this role by South Armagh republican terror boss Sean ‘The Surgeon’ Hughes, who is pictured above standing alongside Sinn Fein TD Mary-Lou McDonald just behind IRA Chief of Staff Martin Lynch . 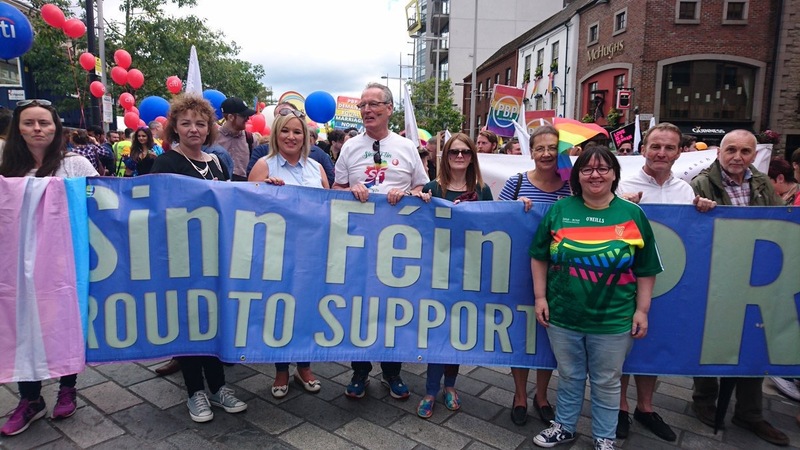 Murray is pictured here on the far right, only last week, attending Gay pride alongside senior Sinn Fein politicians including convicted IRA bomber and Royal Pardon recipient Gerry Kelly. It is clear, even from a most basic glance, that the IRA Army Council- an illegal proscribed terrorist organisation- remain in existence and control the functions of Sinn Fein. This shines a light on the sheer hypocrisy of Sinn Fein when they virtue signal in relation to loyalism. 96 Responses to "NEWS: Unionist Voice highlights Sinn Fein’s continuing links to the IRA Army Council"
I’m somewhat sure I’ll be told plenty of new stuff right right here! Heya i am for the primary time here. I came across this board and I in finding It truly helpful & it helped me out much. I hope to give one thing again and aid others like you aided me. A person essentially help to make seriously articles I would state. This is the first time I frequented your website page and thus far? I amazed with the research you made to make this particular publish incredible. Fantastic job! Admiring the time and energy you put into your website and detailed information you offer. It’s great to come across a blog every once in a while that isn’t the same outdated rehashed material. Excellent read! I’ve saved your site and I’m adding your RSS feeds to my Google account. keep visiting this site and be updated with the most recent news posted here. Wonderful goods from you, man. I have have in mind your stuff previous to and you’re simply extremely fantastic. I actually like what you have received here, certainly like what you are saying and the way in which wherein you say it. You make it enjoyable and you continue to take care of to stay it sensible. I cant wait to learn far more from you. That is really a terrific website. a huge portion of other people will leave out your great writing because of this problem. Wow! At last I got a web site from where I can in fact get helpful facts regarding my study and knowledge. website, I seriously appreciate your way of writing a blog. be checking back soon. Please visit my web site too and tell me how you feel. of genuinely obtain useful information regarding my study and knowledge. This is a fantastic web page, will you be interested in doing an interview about how you developed it? If so e-mail me! generico sito sicuro http://craggmanagement.com/main_images/Image/farmacia/buspirone.html generico Italiano. I’m just writing to make you know of the superb experience my cousin’s daughter experienced studying your webblog. She discovered too many things, most notably what it is like to possess a very effective teaching style to make certain people without hassle learn about specific hard to do issues. You actually surpassed her expectations. Thank you for distributing these warm and helpful, healthy, edifying and cool guidance on your topic to Sandra. Howdy! I just would like to give a huge thumbs up for the great info you may have right here on this post. I will be coming again to your weblog for more soon. It’s actually a nice and helpful piece of information. I’m happy that you just shared this useful info with us. Please keep us up to date like this. Thanks for sharing. Thanks for the good writeup. It actually used to be a entertainment account it. Glance complicated to more delivered agreeable from you! However, how can we keep in touch? I precisely needed to say thanks all over again. I’m not certain the things that I would have undertaken in the absence of these basics shown by you about my problem. Entirely was an absolute depressing matter in my opinion, but witnessing the very skilled mode you managed that forced me to jump for joy. Now i’m thankful for your work and thus hope that you really know what a powerful job you’re putting in training other individuals through the use of your blog post. I am certain you’ve never come across any of us. It is perfect time to make some plans for the future and it is time to be happy. I have read this post and if I could I want to suggest you few interesting things or suggestions. Maybe you can write next articles referring to this article. I wish to read more things about it! Fantastic website you have here but I was wanting to know if you knew of any discussion boards that cover the same topics talked about in this article? I’d really like to be a part of community where I can get suggestions from other experienced individuals that share the same interest. If you have any recommendations, please let me know. Bless you! I’ve been surfing online more than three hours lately, but I never found any interesting article like yours. It is pretty value sufficient for me. In my view, if all site owners and bloggers made excellent content material as you probably did, the internet shall be much more useful than ever before. I together with my pals were found to be studying the best key points on your web page and so all of a sudden got a terrible suspicion I never expressed respect to the web blog owner for those tips. All the guys are already for this reason passionate to read through all of them and have in fact been having fun with those things. Thank you for getting really kind and also for deciding upon such really good subjects most people are really desirous to understand about. My personal honest apologies for not expressing gratitude to earlier. Thanks for sharing excellent informations. Your web-site is so cool. I’m impressed by the details that you’ve on this blog. It reveals how nicely you understand this subject. Bookmarked this website page, will come back for extra articles. You, my friend, ROCK! I found simply the information I already searched everywhere and just couldn’t come across. What an ideal site. We’re a bunch of volunteers and opening a brand new scheme in our community. Your site provided us with helpful information to work on. You have performed a formidable task and our entire community will probably be grateful to you. Next time I read a blog, Hopefully it does not fail me just as much as this particular one. After all, Yes, it was my choice to read through, but I truly thought you would probably have something helpful to say. All I hear is a bunch of crying about something you could fix if you were not too busy searching for attention. Hello, Neat post. There is a problem along with your web site in internet explorer, may test this? I’ll immediately take hold of your rss as I can’t in finding your email subscription hyperlink or newsletter service. Do you’ve any? Please permit me recognise in order that I may subscribe. Thanks. Hello there, I do believe your site could possibly be having web browser compatibility problems. Hello There. I found your weblog using msn. This is an extremely neatly written article. I’ll make sure to bookmark it and come back to read extra of your useful information. Thank you for the post. I will definitely return. It’s in reality a nice and helpful piece of info. I am glad that you just shared this useful information with us. When I originally commented I appear to have clicked the -Notify me when new comments are added- checkbox and now each time a comment is added I receive four emails with the exact same comment. Is there an easy method you are able to remove me from that service? Appreciate it! Greetings! Very useful advice in this particular article! It is the little changes that will make the greatest changes. Thanks for sharing! Good web site you have here.. It’s difficult to find excellent writing like yours these days. I seriously appreciate people like you! Take care! !